Feeling confident enough to cook without a recipe takes experience (and often a few missteps), but being able to make different dishes with the same ingredients is a great skill to have when plans (or your cravings) change direction. We like to call this creative redirection "Basket Hacks." This week, Sun Basket Sous Chef Ali Ramee turned our pan-roasted delicata squash with sage, white beans, and kale into an impressive stuffed squash for a quick cold-weather dinner. This recipe is versatile and can be made with any type of squash. The possibilities for the filling are limited only by your imagination and what's on hand in your pantry. Trim the ends from the squash and cut the squash in half lengthwise; using a spoon, scoop out the seeds. Season the cut sides of the squash with salt and pepper. Drizzle 1 to 2 tablespoons oil on the cut side of the squash. On a lightly oiled sheet pan, place the squash cut side down and roast until tender when pierced with a sharp knife, 20 to 25 minutes. While the squash roasts, prepare the stuffing. Finely chop, press, or grate enough garlic to measure 1 teaspoon. In a large frying pan over medium-high heat, warm 1 tablespoon oil until hot but not smoking. Add the mirepoix and cook, stirring occasionally, until starting to soften, 3 to 4 minutes. Stir in the garlic and tomato paste and cook until fragrant, about 30 seconds. Add the kale and cook, stirring occasionally, until the kale begins to wilt, 2 to 3 minutes. Stir in the white beans, tomatoes, allspice, walnuts, and as many red chile flakes as you like; bring to a boil and immediately remove from the heat. Stir in the lemon juice and season to taste with salt and pepper. 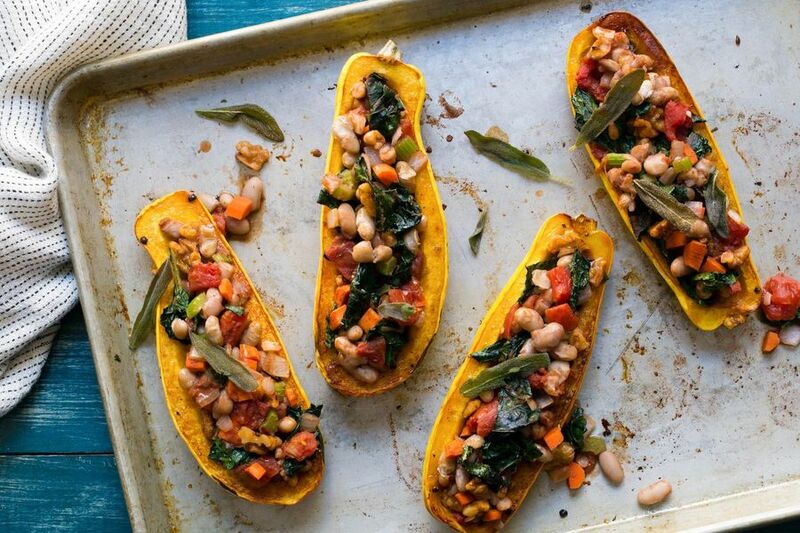 Remove the squash from the oven; using tongs or spatula, turn the squash cut sides up and fill each with the kale-bean stuffing; wipe out the pan. Return the squash to the oven and continue roasting until the kale-bean stuffing is bubbling hot, 8 to 10 minutes. While the stuffed squash roast, prepare the sage. Strip the sage leaves from the stems. In the same pan used for the stuffing, over medium-high heat, warm 1 tablespoon oil until hot but not smoking. Add the sage leaves and cook, turning once, until crisped and fragrant, about 15 seconds per side. Transfer to a paper towel-lined plate. Transfer the squash to individual plates, top with fried sage, and serve. Nutrition per serving: Calories: 680, Protein: 17g (34% DV), Fiber: 20g (80% DV), Total Fat: 43g (66% DV), Monounsaturated Fat: 22g, Polyunsaturated Fat: 13g, Saturated Fat: 5g (25% DV), Cholesterol: 0mg (0% DV), Sodium: 130mg (5% DV), Carbohydrates: 69g (23% DV), Total Sugars: 11g, Added Sugars: 0g (0% DV). Not a significant source of trans fat.